"It seems to me that television is exactly like a gun. Your enjoyment of it is determined by which end of it you're on." What's a man to do once he's established himself as the crème de la crème of cinematic suspense? As if being one of the preeminent directors of the silent era wasn't enough, the Shakespeare-of-film only improved his artistry in the 1930s, and then became a living legend when he came to Hollywood in 1940. In every sense of the word, Alfred Hitchcock was a genius, and when TV came onto the scene in the 1950s, causing the studios to panic, the Master of Suspense created one of the all-time best television programs, aptly titled Alfred Hitchcock Presents. Premiering on October 2, 1955 the show became a smashing success. Watching the series today, little has been lost over the past half century, with every episode featuring masterful direction, elegant acting, and superb writing. Working from the deliciously irreverent writing of James B. Allardice, America's favorite auteur provides the lead-in and lead-out to each episode. While only directing a handful of episodes, Hitchcock is still clearly the dominant force at all times. His unique sense of the macabre and insatiable delight in black comedy clearly set the tone for the rest of the directing staff, which includes Robert Stevens and Robert Stevenson among others. The overarching theme of Alfred Hitchcock Presents: Season One seems mostly to be about the shortcomings of the American dream. In the series premiere, Revenge (directed by Hitchcock), Carl Span (Ralph Meeker) and his ballerina wife Elsa (Vera Miles) begin a life together, moving into a new home as he starts a promising job. However, darkness creeps into their comfortable life when Carl returns home to find Elsa's been brutally beaten and is now a psychological mess. The police fail to bring about justice, causing Carl to take matters into his own hands with an ironic, devastating result. Such is the course many of these stories take and while the social mores of the '50s prevent anybody from getting away with murder, there's a tremendous sense of cynicism that could easily pass for contemporary TV drama. The format of the program is entirely different from recent shows, with each week's episode being a story onto itself. In Premonition, renowned pianist Kim Stranger (John Forsythe) returns home to discover his father's been dead for four years and his brother and sister-in-law (Warren Stevens and Cloris Leachman, respectively) may be responsible. The script takes Kim's search to its conclusion assuredly and delivers a genuine surprise ending. Another highlight of the season is Breakdown, in which a wealthy business tycoon named William Callew (Joseph Cotten) is paralyzed in a car accident and is helpless as the coroner pronounces him dead. Directed by Hitchcock, this episode overflows with suspense as Callew desperately yearns to escape his impending, horrific death. It's my favorite entry of the season, but running a close second is The Case of Mr. Pelham, in which Albert Pelham (Tom Ewell) discovers that someone is impersonating him and slowly taking over his life. Now he must outfox the imposter, lest everyone suspect he's the faux Pelham. Many other installments in this freshman season are pure delights. Bringing in the Christmas cheer, Santa Claus and the 10th Avenue Kid is a tender story about ex-con Stretch Sears (Barry Fitzgerald) working as a department store Santa and putting his kleptomania to good use for a make-shift Tiny Tim. The episode also features a delightful lead-in, as Hitchcock bricks up his chimney to keep Santa from tracking soot in. There are also enjoyable starring roles for John Cassavetes, as escaped murderer Sam Cobbett taking a stranded housewife (Marisa Pavan) hostage in You Got to Have Luck, and Claude Rains, who chews the scenery in And So Died Riabouchinska. Playing an eccentric ventriliquist, Rains must fend off a nosy police officer (Charles Bronson!) who pressures him about the death of a former associate. And, for the revisionist historian in each of us, The Older Sister gets at the truth of the infamous Lizzie Borden case. All 39 episodes provide great entertainment and wonderful technical craftsmanship. More than a few of the various scores emulate Bernard Herrmann's work and the black-and-white cinematography aids the show's element of suspense immeasurably. The impressive collection of A-list actors—including Joanne Woodward, Sidney Blackmer, Beulah Bondi, Claire Trevor, Jo Van Fleet, Werner Klemperer—consistently turn in stellar work. Bronson, who also stars as a husband with a sinister plot in There Was an Old Woman, proves that beneath his stoic demeanor lies a mostly untapped acting talent. Cotten also is fabulous in his starring role, conveying all of his emotion through voiceovers, and brings the dire situation facing William Callew right into the viewer's state-of-mind. Without the topnotch acting, a lot of the thrills would fall flat. However, the real star of the show is Alfred Hitchcock. The theme music is immediately associated with his silhouette and his plump figure will likely send a smile to everybody's face. He approved every story and, while the day-to-day operations were left principally to Norman Lloyd, this is definitely his project. The humor and aesthetic sensibilities play as perfect counterparts to his career on the big screen. Speaking of that, normally I thinks of the countless feature-length classics Hitchcock blessed audiences with, but seeing this first season of Alfred Hitchcock Presents proves that he was one of television's greatest talents as well. Image Transfer Review: The transfer does reflect the image's age, however this is actually a fairly good picture. The Hitchcock segments look the weakest, containing plenty of scratches and debris, but the stories themselves feature strong contrast, solid blacks, and good detail. Print defects are noticeable, but aren't distracting. The overall image is nothing terribly impressive, but works well. Audio Transfer Review: The mono mix preserves the original broadcast audio, which is nice from an historical point-of-view. However, there's a great deal of hiss on just about every episode that is distracting. Dialogue can always be understood and the music comes across nicely. Extras Review: The three-disc set contains double-sided discs, with Side A of Disc 1 containing two trailers. "Universal Studios Home Video Trailer" promotes Klochak: The Night Stalker, American Gothic: The Complete Series DVD, and The Munsters: Season Two DVD. A second trailer for Law and Order highlights the franchise's various DVD season sets available. The only other supplemental can be found on Disc 3, Side B. Alfred Hitchcock Presents: A Look Back (14m:42s) contains interviews with Pat Hitchock (Hitchcock's daughter and a regular character actor on the show), Norman Lloyd (one of its runners), and Hilton Green (an assistant director). They discuss the origins of the series and the Master's enthusiasm for the idea. Some of their comments allude to future seasons, but most of the material here concerns Hitchcock making the transition from feature films to television, as well as the show's impact on his celebrity. 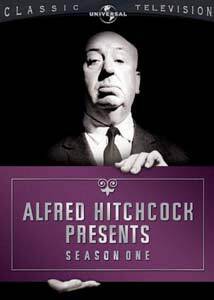 A wonderful companion to Universal's Alfred Hitchcock: The Masterpiece Collection , Alfred Hitchcock Presents: Season One is a milestone in television history. The transfers adequately present each episode and although the set is light on special features, this is still highly recommended.